Catch a glimpse of the aurora borealis. We commonly associate the aurora borealis with such Arctic images as polar bears and marginally sane explorers mushing through snowdrifts. But the curtains of riotous color are not confined to distant, frozen lands. To see the eerie spectacle of the northern lights, you need only journey to the nearest clear, dark sky. That’s because the displays are part of an immense luminous loop centered over Earth’s north magnetic pole, where compasses point, rather than the geographic pole, about which Earth rotates. By sheer good fortune the north magnetic pole lies in nearby Canada, due north of the Texas panhandle at about latitude 77 degrees--much closer to us than the pole of rotation. People at our latitude in Europe or Asia are hundreds of miles farther from this auroral oval, and it makes all the difference. Auroras occur monthly or more over northern parts of the United States. European sites equally far north are out of luck: Rome sees them only every three to five years. Nor is the City of Lights a good place for northern lights; they’re as infrequent in Paris as in Florida (1 percent of all nights) even though the Eiffel Tower’s latitude matches that of Vancouver, where they blaze almost weekly. None of this matters if you live under the synthetic pastels that paint today’s urban ceilings. But in rural areas in the northern third of the United States, majestic displays periodically adorn backyard skies. If your site’s good enough to show the Milky Way, you’ll see auroras as well. So forget dogsleds and igloos. All you need are the crisp, moonless conditions of the first half of December. A little warning might be nice, too--and it’s possible to get it if you have a telescope with a solar filter. Look for a giant sunspot group carried by the sun’s rotation toward the center of its disk. When the storm faces us it may send a blast of charged particles across Earth’s magnetic field, generating the electricity that excites electrons some 100 miles overhead. This is major- league energy, dwarfing the power of lightning: tens of millions of amperes at around 50,000 volts are typically channeled into auroras, lighting up the atmosphere like the gases in streetlights. No telescope? 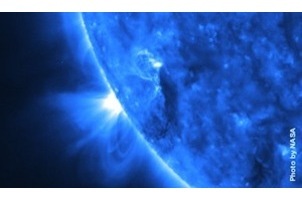 Then dial (303) 497-3235 for current information on solar activity: the sun, by phone. Now that you know how to get advance notice of an aurora, here’s another tip: forget it. Predicted auroras seldom materialize, while the best displays often arrive unheralded. The optimum method to ensure a sighting, assuming you live under dark skies, is just to glance north at night. Your local astronomy club could organize an aurora hot line similar to the one in my town--when someone spots the alien glow, others are phoned. An aurora may simply be a pale greenish or ruby patch, but no two are identical; they can exhibit blotches, rays, bands, arcs, or curtains. They can be nearly motionless, pulsate leisurely, or flicker rapidly with several new scenes every second. Their silence is eerie, and so are periodic reports of hisses or crackles, sometimes attributed to the controversial notion that people are able to sense the huge electric charges on the ground beneath the bright displays. Now you can still be as effective an observer as in the bygone centuries before the technological revolution. Because those who seek will, some night, experience the awesome Lights of the North--even if they live in the South.